"Mission bells mark the road again"
Motorists cruising El Camino Real down the Peninsula and Highway 101 through the South Bay will soon be seeing the return of an old California tradition -- roadside mission bells that mark the historic route. Crews are moving north this week in Santa Clara and San Mateo counties installing the distinctive bells -- 17 1/2-inch diameter cast iron bells that hang from a 15-foot post and staff that resembles a giant question mark. The work is part of the latest and most comprehensive effort to preserve the bells and the legacy of El Camino Real, "The King's Highway" built in the 18th century to help protect Spanish landholdings in California and link the missions, pueblos and presidios that existed between San Diego and Sonoma. The bells didn't appear until 1906 -- the first, in downtown Los Angeles -- installed as part of an effort by the California Federation of Women's Clubs to preserve the legacy of El Camino Real, which was already beginning to disappear largely because of development. It is unclear exactly how many roadside bells were installed at the time, but over the years, many of them disappeared -- victims of neglect, vandalism, development, highway construction and collisions. By 1960, highway historians estimate, as few as 75 remained. Various efforts to replace them have come and gone. One of the largest was in 1963, the 250th anniversary of the birth of Padre Junipero Serra, regarded as the father of the California missions and a major force in the Spanish colonization of the state. The current effort, a $1.4 million project paid for by Caltrans with federal highway beautification funds, will add about 568 bells, mostly to Highway 101, which roughly follows El Camino Real's route, between Los Angeles and South San Francisco. In the Bay Area, the route exits 101 in San Jose and follows Highway 82, which becomes El Camino Real on the Peninsula. Already the bells, posts and signs reading "Historic El Camino Real" have been installed about every 1.4 miles along Highway 101 between Santa Barbara and Gilroy. The entire project could be completed in time for Thanksgiving travelers to count the bells on their journeys in two weeks. 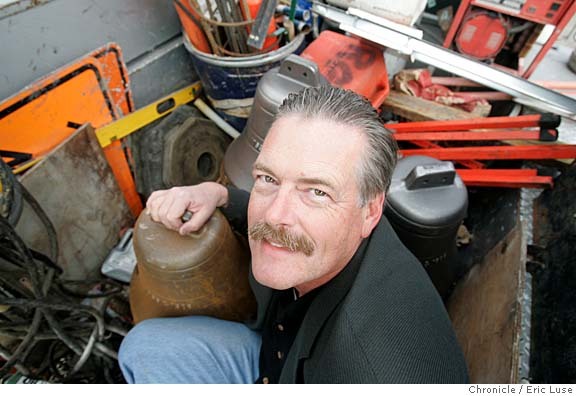 The restoration of the El Camino Real bells was driven not by an official state directive but by a South Bay man with a love for California history and for the bells. "I've been really enthusiastic about the El Camino Real bells since I was in third grade," said John Kolstad, a Saratoga mortgage broker. "There was a bell near my house in Whittier and I always thought it was cool." In 1998, still enamored with the bells, Kolstad tried to find one to install in his backyard. He tracked down Joe Rice, the by then 84-year-old owner of the California Bell Co., which manufactured the original El Camino bells in 1906 and the 1963 replacement bells before going out of business. "He said, 'I won't sell you a bell, but I'll sell you the whole company,' " Kolstad said. After balking a bit, Kolstad took Rice up on the offer, for a price he won't disclose. And when he went to Rice's garage to clear out the contents of the "company" -- molds, patterns, tolls, equipment and old bells -- he discovered he had what he needed to replicate the original bells from 1906. 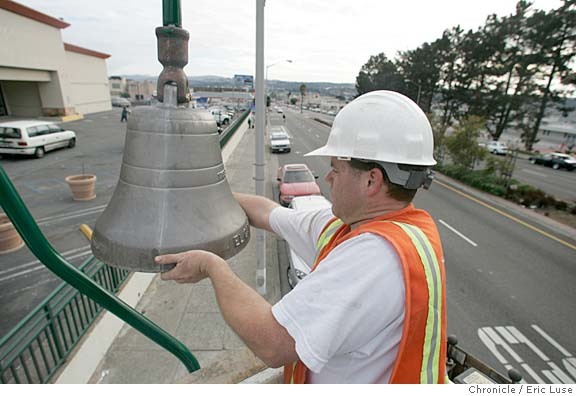 That led to a deal he struck with Caltrans to manufacture new bells, sell them to the state and have them installed along Highway 101. The bells, which weigh 85 pounds each, are being produced at a foundry in Huntington Park in Los Angeles County. Each has raised letters spelling out "1906 & 1963" and "El Camino Real" on the front and "Copyrighted 1906 by Mrs. A.S.C. Forbes" on the back. Forbes was the designer of the bells and led the women's clubs' push to mark El Camino Real with them in the early 1900s. Among many Californians, the bells evoke warm feelings and pleasant memories of drives along the coast, family vacations or the way the state used to be. "They're a symbolic part of our history," said Lee Ford, a AAA of Northern California employee who headed an unrelated 1996 restoration effort. "They're nostalgic, and they show our connection with Mexico." Kolstad, who's helping coordinate the installation of bells, said he's received an enthusiastic response from the public. "So many people are just excited when they find out about it," he said. "They've seen (the bells) while driving up and down the highway, and they love them." Caltrans spokesman David Anderson said the state is paying for 12 percent of the project -- $168,000 -- as required by the terms of the federal grant. 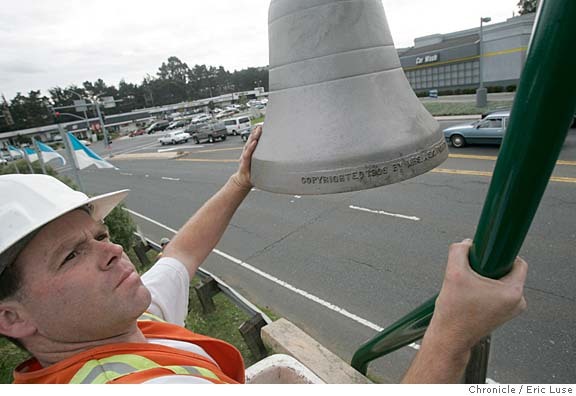 A contractor, Superior Traffic, buys the bells from Kolstad and installs them. Anderson said Caltrans selected Kolstad's bells out of a desire for historical accuracy. "We believe in preserving California's historical heritage," he said, "and the original 1906 mission bell reflects our history. The company hired to provide bells owns the copyright on that 1906 bell, so they're the only ones that can manufacture those bells."